While some brides may prefer a big city wedding others go for a country or western themed wedding. Lately brides have been finding some creative ways to bring in that country feeling into their big day. There are little western details that many guests may not notice until it’s time to hit the dance floor, like wearing cowboy boots under the wedding dress. While you look for the perfect western balance on your wedding day incorporate the western atmosphere into the events that lead up to the big day as well. 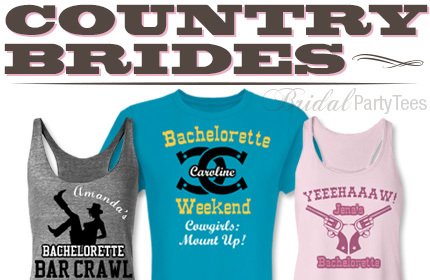 Use your bachelorette party, bridal shower or engagement party as a little preview of what your guests and bridal party members can expect on your big day by creating custom western wedding shirts and tank tops for these events. Even if you aren’t going for any type of western theme that doesn’t mean you can’t show off your country love with a custom shirt. 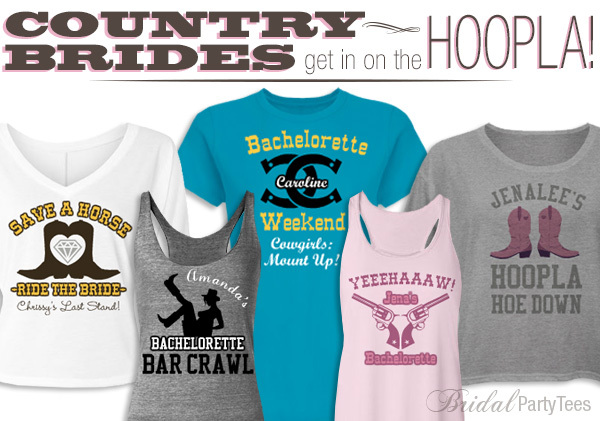 Perhaps you want to give your bachelorette night a country vibe? Then you will want to check out our Cowgirl Bar Crawl tank top and our Save a Horse Ride a Bride shirt to wear when celebrating your last night before you ride off into the sunset with your other half. 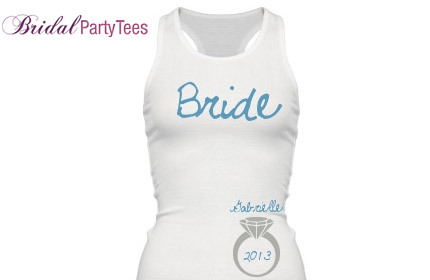 When you and your girls go out for your bachelorette party go out as a team with Team “Brides Name” Tank Tops! When you celebrate one of your last nights as a single lady with your friends and bridal party show who the members of your team are on your wedding day by customizing bachelorette party tanks for each bridal member. Proudly display the fact that these ladies from your left and right are there to support you. 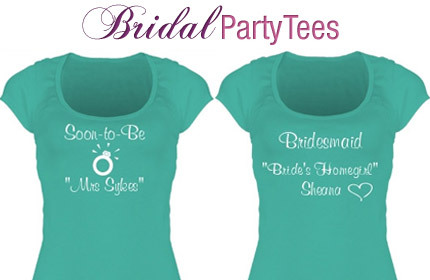 Show who holds what position in your bridal party by adding the maid of honor title or bridesmaid title under your team name to the customized bridal party shirt or customized bridal party tank. Go the extra mile and add in art and the date! You can keep it simple and elegant like our customer did here with the bachelorette party ring and date tanks or you can go all out, just make sure the design fits your style and personality! No announcement will be needed when you arrive for your bachelorette party wearing your Soon-to-Be scoop neck shirt. Here is your chance to get creative and customize a shirt that says “Soon-to-be Mrs. [Your New Last Name Here]”. 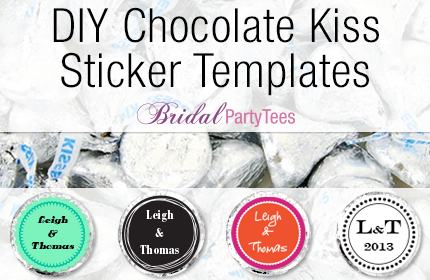 Do you have a special nickname for each girl in your bridal party? Nicknames and inside jokes are terrific ideas for custom shirts, because it makes the design that much more unique. Having something that is absolutely one-of-a-kind can make your bachelorette party even more memorable. So while you are rocking the Soon-to-Be shirt, give your maid of honor and your bridesmaids their own Bridal Party Nickname shirts for the night of the party. You know your girls better then anyone so show it to them by putting their nickname or unique attribute on a bridal party tee. In this photo you can see one of our customers has personalized her tees by adding “Shy Friend” to her bridesmaid tee and “Bride’s Homegirl” to another. 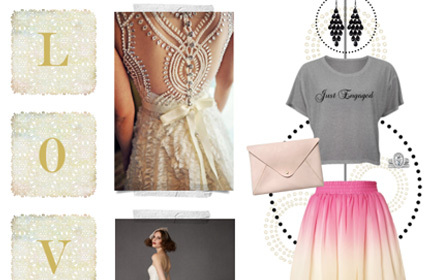 What would you add to your Soon-to-Be shirt and your bridesmaid’s Nickname shirts? If you are planning a wedding or just a big fan of weddings in general then chances are you watch TLC’s “Four Weddings.” Recently, one of the brides was sporting Bridal Party Tee’s “I Got One” Bride Tank Top! Emma wore her “I Got One” Tank Top at the end of her wedding for her sparkler send off which is a really cute and unique idea since most Bride’s wear their shirts while they are getting ready for their big day. This is a great way to show off your new last name in front of all your guests! Check out our “I Got One” Bride Shirts so you can have your own on your big day! 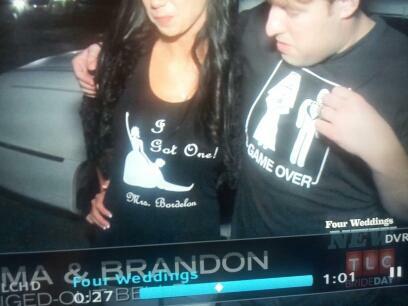 And if you’re man is digging the Groom’s shirt then check out our Game Over Shirts too. The now Mrs. Bordelon was in the fact the winner of this episode and won an incredible romantic getaway to Mexico for their honeymoon! We’re not bias or anything but we think the tank top secured the win. Here’s a clearer picture of our tank top on the happy newlywed! At Bridal Party Tee’s we love nothing more than seeing our Bride’s and Bride-To-Be’s happily wearing our designs so make sure to send in your customer photos at bridalpartytees@eretailing.com. Who knows, you could be our next featured Bride! Baseball season is finally here, it’s that time of the year when you have a love for two diamonds! 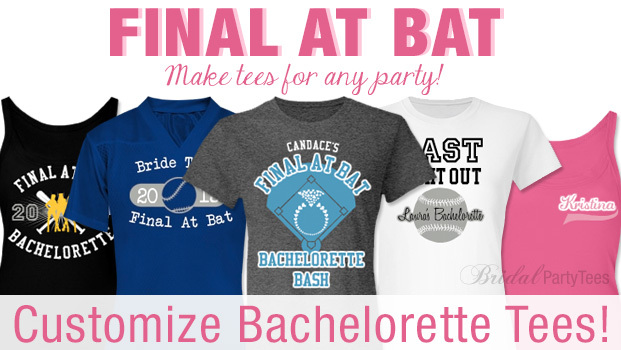 As you merge your love for baseball with the excitement you have for your upcoming bachelorette party consider making it a home run with a Final At Bat bachelorette shirt! Our ladies love to show off their passion for sports including Americas favorite past time. If you’re a sporty girl and looking to bring baseball into your bachelorette party, our Final At Bat shirts are a fun clever way to do just that. 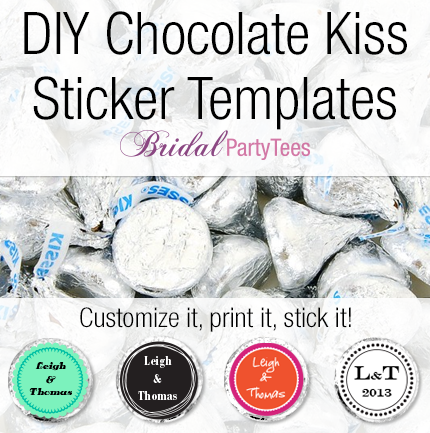 It will even be a hit with the non-sport lovers of your bridal party. 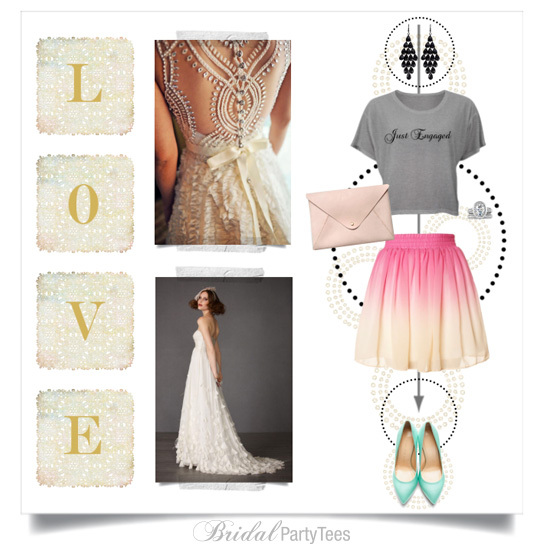 At Bridal Party Tees we always want to make sure you have the sporty style options you want. That’s why we carry our Final At Bat designs in crewneck tees, ¾ sleeve jersey tees, mesh football jerseys and sheer longer length rib strap tank tops. Use our design center to customize any of the Final At Bat shirts in our gallery by changing the colors to fit your favorite baseball team or if you played softball use the colors of your high school or college team. Even if you didn’t play softball or don’t have a favorite team in mind, don’t worry because a girl can’t go wrong with pink. Our Baseball Laces bachelorette tee is featured in a pink color. However as you know you always have the freedom to change the color on any of our looks. 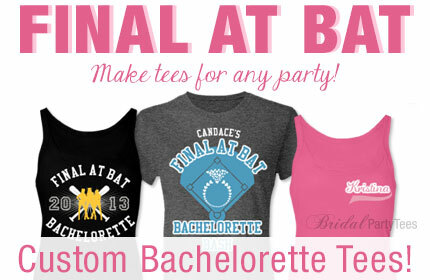 These Final At Bat shirts will surely be a game winner on your bachelorette party.